Squash House Quilts: What Difference A Border Makes! **Update - someone commented anonymously and asked if I was going to do the embroidered borders on each block now that they are sewn together. If you mean doing the fly stitch - yes, and I think that part will go really fast compared to all of the other stitcheries! Two posts in one day - a first for me! 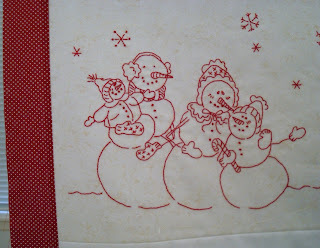 I sewed the borders on the snow people and just had to show you what a difference it makes in how they look! Mr. Squash held it up for me so I could get a better photo. He's been hard at work today raking leaves and cleaning up the yard from our snowstorms! Here is a close-up of the border - a tiny red and white polka dot. 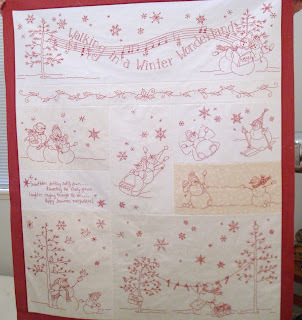 Also, don't forget to leave a comment on this post for the Whirl Into Winter giveaway! Hi I came by your blog from the Quilter get Listed Blog.I have enjoyed looking through you blog.Do you mind If I put you in my Blog List on my sidebar? i am doing this quilt too and i was wondering if you are going to put the emb. borders on each block now that they are joined. i think it looks great and was dreading doing that. I love it!!! How very cute! I am in love with that quilt!!!! Your redwork stitchery is adorable....I love doing redwork. What...raking leaves....we have over 2 feet of snow covering everything. Thanks for sharing the great pics.